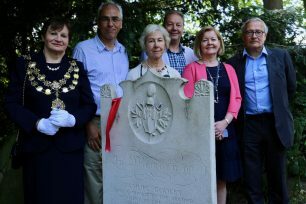 On 16 June 2017 to mark Waterloo Day, the recent renovation of Godley’s gravestone in St John’s Wood Burial Ground was unveiled in a ceremony commemorating the end of the first year of the project. The day started at Lord’s Cricket Ground, where the MOD Theatre Company presented their interactive musical play about Godley’s life. 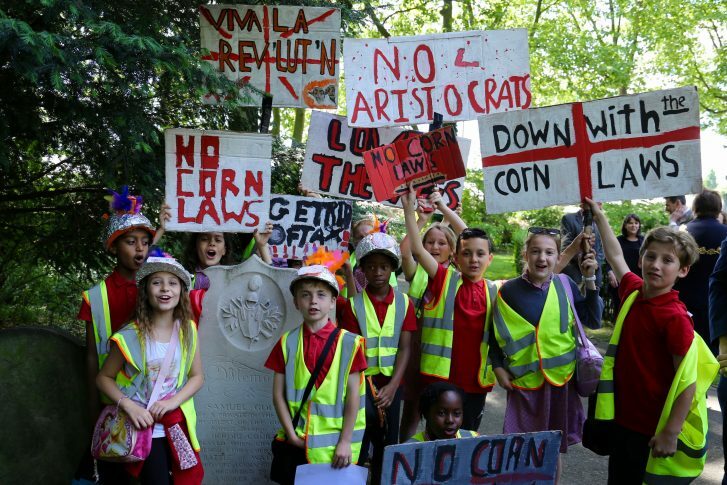 This play built upon the play-in-a-day workshops held in early June 2017.The Westminster Cathedral Year 5s played the part of the aristocracy and common people of London in the Westminster riots. 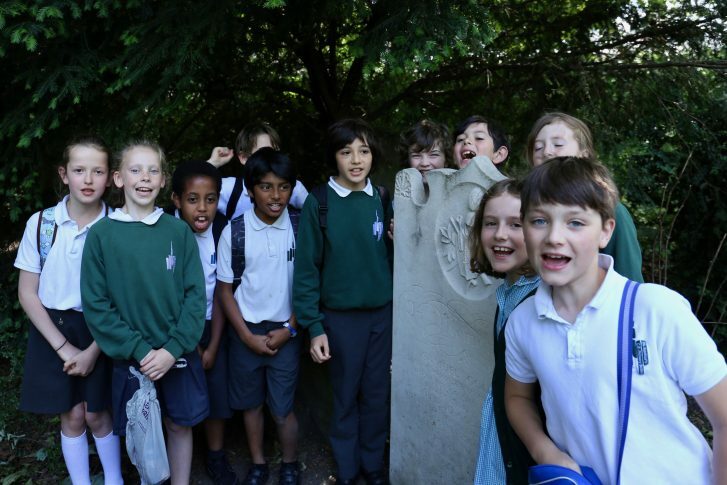 The remaining three Year 5 classes from Barrow Hill School and St Saviour’s Church of England School each played a different faction in the Battle of Waterloo – French, German and English – and engaged in an elaborately staged, and partially historically accurate, series of charges. 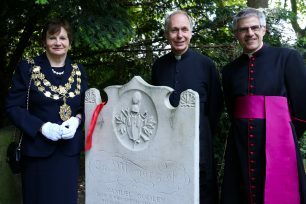 The unveiling ceremony for the restored gravestone was conducted by the Councillor Judith Warner, Deputy Lord Mayor and the Vicar of St John’s Wood, Father Anders Bergquist. The event was also attended by the Archdeacon of London, the Venerable Luke Miller, Lord and Lady Anglesey, Councillor Robert Rigby and representatives from the National Army Museum and the Household Cavalry Museum,Chelsea pensioners and support staff from the Royal Hospital, members of the St John’s Wood History Society, as well as descendants of Samuel Godley. The conservation work on the stone was funded by the Regent’s Park Ward councillors. The faculty petition to complete the works was supported and funded by the Diocese of London. The Venerable Luke Miller, Archdeacon of London said: “It has been splendid to be able to work in partnership with the Samuel Godley Project to support what has been a great educational event as well as honouring Private Godley himself and restoring his memorial. It was good to see old and young coming together in the church and churchyard to share our common history, give thanks for the past and think on how we are to live for the future. I think Pte Godley would have been pleased”. David Tomlinson, head teacher of Barrow Hill School said:“projects such as this are rare. [The children] have gained a significant amount from this high quality input which will set them up well for secondary school”. Peter Daniel, Education Officer for the Westminster Archives, said: “As an organisation, we believe that Westminster Archives has an important role in strengthening community bonds by making all of our diverse community aware of the rich history of our wonderful city. 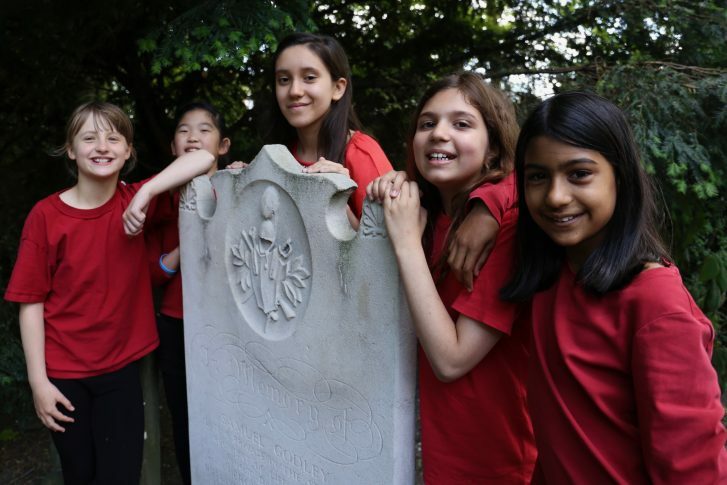 Consequently, we were delighted that our four participating classes from Barrow Hill, Westminster Cathedral and St Saviour’s primary schools had the opportunity to attend the ceremony we arranged to mark the repairs undertaken to Samuel Godley’s gravestone. 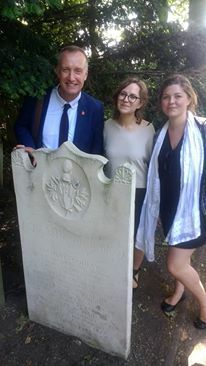 Local councillors, members of Godley’s family and the St John’s Wood Society joined them at the grave having previously attended both a special service at St John’s Wood Church and taken part in an interactive musical show about Godley’s life at the neighbouring Lord’s cricket ground. A true bringing together of the Westminster community”. The Westminster Archives team is now hard at work organising phase 2 of the project, which will include the making of an animation film, will repeat the most successful workshops, and include talks for the local community. Keep your eyes out for a touring exhibition in the Westminster Council public libraries. This page was added on 11/07/2017.